Hong Kong skateboarding retailer and streetwear brand 8Five2 is celebrating its 20th anniversary with the release of a custom G-Shock DW-5600. The white watch has a marble-like print on the bands that resembles the interior of 8Five2’s shops, with the brand’s logo appearing on the lower band. This release is limited to 100 and each watch has its production number printed on the case back. 8Five2 is also giving away a free cap to lucky customers who receive a double-digit production number with two of the same digits. The 8Five2 x G-Shock DW-5600 is available at shop.8five2.com for $1,280 HKD. International shipping is available. 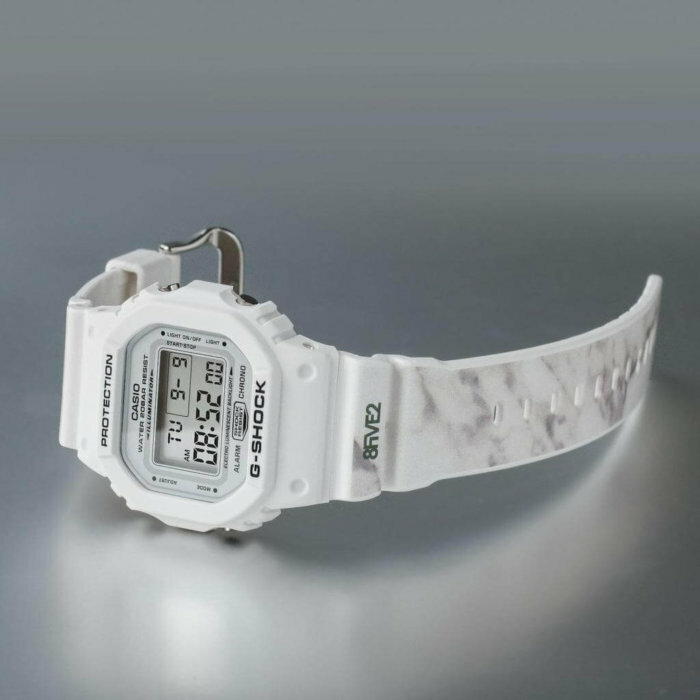 #8five2 x @gshock_hongkong DW-5600 #20thanniversary #marble is now available exclusively at 8FIVE2 and online www.8five2.com Retail at HKD1,280 Only 100 pcs available worldwide and each of them are numbered. Anyone got the double digits (11, 22, 33, 44, 55, 66, 77, 88, 99) will get a free cap from 8FIVE2 products. Enjoy.